Muriel Le Roux et Sébastien Richez (dir. ), Eugène Vaillé, Éditions P.I.E. Peter Lang, juillet 2018, 329 pages, collection « Histoire de la Poste et des Communications ». 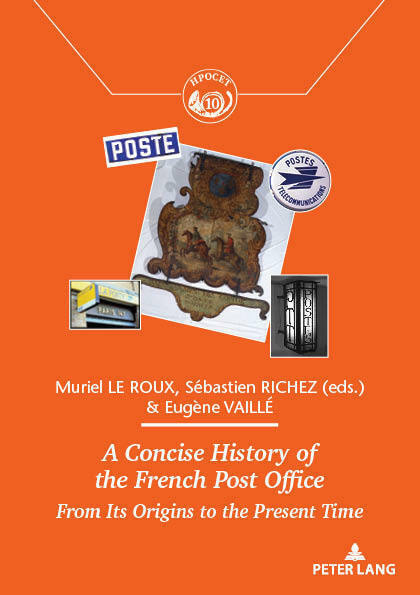 This edition is the first synthesis published in English, dealing with the general history of the postal services or the Post Office, in France, from the origins to the present time gathering different studies. Two early books written by one of the first historian of the postal Ancient Regime and promotor of the French postal museum in Paris, Eugène Vaillé, had already founded a large part of the French historiography about the postal issue : Histoire des postes françaises jusqu’à la Révolution (Presses universitaires de France, 1946), Histoire des postes françaises depuis la Révolution (Presses universitaires de France, 1947). Then, a recent collective work, directed by Muriel Le Roux, historian at the CNRS and Sébastien Richez, historian at the comité pour l’histoire de La Poste, studies the contemporary history of this French administration, transformed in a public company in 1991 : Brève histoire de la Poste en France depuis 1945 (PIE Peter Lang, 2016). These texts have been translated by Kenneth Berry for Vaillé, and Georgina Banfield for those edited by Le Roux and Richez.